Adobe Illustrator’s 3D effects have some sophisticated settings that allow you to add lighting and adjust surface properties of 3D vector objects. Understanding how to use these settings can help you to recreate realistic materials such as plastic and gold, and achieve some interesting “ultra-shiny” lighting effects fairly quickly. In this tutorial, we’ll explore these 3D lighting and shading effects. Surface Shading Types The first setting that has a big impact on your 3D object’s appearance is the surface shading type. There are four types to choose from, and each has a distinct look, as illustrated below. First, draw with the Pen tool shape 1 for the head and body, and then shape 2 for the arms. Next, give them a nice cyan fill from the Swatches panel. Select them and turn these 2D shapes into 3D objects by applying the 3D Revolve effect. Do this by clicking on the menu Effect > 3D > Revolve. In the 3D Revolve Options dialog box that pops up, simply select a surface type from theSurface dropdown menu. Plastic Shading is very shiny and is the only surface type that has highlights, so it is suitable for illustrating objects that have a glossy or reflective surface. Diffuse Shading has a soft matte look since it has no highlights, so it is great for cardboard or wood. Wireframe completely ignores the fill color and renders the 3D object as transparent, with lots of black thin lines outlining its geometry. This is especially useful for a technical or blueprint look. No Shading does not have any lighting options and paints all surfaces of the 3D object the same color as the 2D object. This makes the 3D object look completely flat. So in this case, our person icon looks silhouetted. Now that we know the different surface shading types, select Plastic Shading from this menu and move swiftly on to the Light Sphere directly below it. If you cannot see all the surface and lighting settings, click the More Options button to reveal them. The Light Sphere is where you can position lights to illuminate your 3D object. Lights are represented by little dots, and you can move them by clicking on a light and dragging it around the sphere surface. To place a light behind the sphere just click the Move selected light to back of objectbutton. By default there is only one light, but you can add new lights by clicking on the New Light button. Each light will produce a highlight, so the more lights that you have, the brighter our person icon becomes. Let’s add six lights and position them around the sphere like I’ve done below. Next, increase the Ambient Light setting slightly so the lighting all around the 3D object is much brighter. I’ve moved it from the standard 50% to 69%. Finally, increase the Highlight Intensity value all the way up to 100% to make the highlights really stand out. Our cyan plastic person has now changed into someone that is much more shiny and attractive! The shading color is the color that is mixed with the main color of your 3D object, and it is most visible in the shadow areas. By default 3D objects are shaded with black, but in reality not all objects are black in their shadow areas. Fortunately, by selecting the Custom option in the Shading Color dropdown menu, we can change this. Simply click the color box next to this and a color chooser dialog box will pop up for you to choose a different color. In the example above, I have used the Type tool to create a dollar sign by typing this sign on the keyboard. Next, set the fill color to a dark yellow using the Swatches panel and apply the 3D Extrude & Bevel effect to it by clicking on the menu Effect > 3D > Extrude & Bevel. The first dollar sign is shaded with black, and has shadow areas that are slightly too dark for gold. By changing the shading color to a burgundy-brown, we instantly get a more convincing gold look. 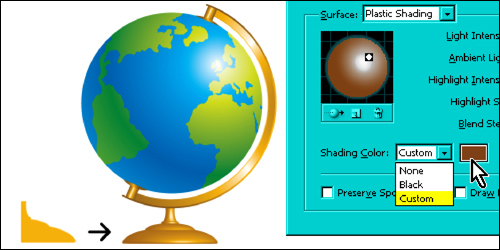 The same technique was also used below to create a gold base for a globe – I chose a nice chocolate-brown shading color and used the standard one light. There are many more lighting effects and surface materials you can create, once you get the hang of it. Now that you’re familiar with the main settings, start experimenting with them to see what you can create for yourself. Give it a try!